Mickey McCarter: Good afternoon, Gary. Thank for making the time to chat today! MM: You’re in the United States touring with Nick Mason’s Saucerful of Secrets. How did you get involved with this act? GK: Yeah, I have known Nick for about 15 years, and Guy Pratt’s been of friend of mine since the ’80s. You know who Guy Pratt is? Guy’s played bass with Pink Floyd since Roger Waters left in 1987. And he’s the bass player for David Gilmour. He played on all the Pink Floyd records after Roger left. And he’s one of my best friends. So, Guy, Nick, and a guy called Lee Harris — Lee played with The Blockheads — were in conversation about a concept that Lee had about a concept of Nick taking on something that would be more unique for him to do, which is the early Pink Floyd material, prior to Dark Side of the Moon, where Nick’s drum work was a lot more apparent and much more idiosyncratic. Also, it would separate him from what Roger and David do, and stop Nick having to go out with 10 session musicians, or trying to emulate David’s guitar solos, which is what everyone else does. There are hundreds of these, and so it gave Nick something that was more original. Guy suggested me as the second guitar player, and also as one of the main singers. So Guy and I share the singing, as Roger and David did, and Syd Barrett and Roger in the early days. We thought the concept was great. Well, a year ago, we got together in the rehearsal room, and we tried it out. Nick hadn’t played in a band for a long time, although he’s the only member of Pink Floyd that’s been in there since the beginning. David came in after Syd left, and then Roger left, and Nick has been the constant in the band. When we started, and our philosophy was that we wouldn’t be just emulating the tracks as they were, that we would make them our own as well, because we’re not session players, we’re proper musicians who enjoy our own characteristics as musicians, if you like. And we didn’t want Nick just to have a tribute band formed around him. So we approached every arrangement, after listening to the tracks, in our own way, but with the characteristics and the flavor of the psychedelic era, if you like, but brought up into a modern time. We enjoyed what we were doing, and it was sounding great. And then we decided to try it out. We did a family and friends show, and then we played four small gigs in London, which were absolutely slammed, as you can imagine. We played the Dingwalls club in London, then we did three nights at this small pub in Fulham called the Half Moon Pub, which only holds 500 people. And it was really successful, and so we took it out on the road. We did Europe, and we did some of the UK, and now we’ve been out in the States doing 30-odd dates. MM: How has the reception been in the United States? GK: Oh, the reviews have been incredible. Pink Floyd fans are pretty much the same all over the world. They’re very devoted, but they’re very analytical. And they’re people with a great sense of what’s right and wrong in the Pink Floyd world. And I think they’re there to honor Nick, but they wouldn’t be so rapturous unless they approved of the music. There was a certain amount of cynicism about me being in the band, given my background was what some perceived as being overtly pop music. But I had a connection with Syd Barrett that came through David Bowie. I mean the first time I ever heard Syd’s music would have been the David Bowie Pinups version of “See Emily Play.” And I think I used a few of those riffs that Mick Ronson created for that within the live show we do as a homage to where I first got my first viewing of early Pink Floyd. But if it wasn’t for Syd Barrett, and the way he looked, and the way he sang, and the way he behaved, there wouldn’t have been Ziggy Stardust. There wouldn’t have been Johnny Rotten. There’s a line to be drawn between these London boys that have given me the pop music that I know. And of course their sensibility to the theatrics. So, I feel comfortable singing Syd’s songs but channeled through all of those guys. MM: My personal reaction when I discovered that you were associated with his project, and I only speak for myself — I thought you were sort of a big gun for something like this. So your explanation of how it came about sheds a lot of light on it for me. GK: Well, you can’t get a bigger gun than Nick Mason, and Pink Floyd I’m afraid. They have 30 million followers on their Facebook page — these guys are enormous, and Nick is much more. He’s a proper, genuine rockstar who really did dominate the business with Pink Floyd in the ’60s, ’70s, and the ’80s. And even in the ’90s when they did that ’94 tour. So I don’t perceive myself as a big gun in this. I perceive myself as someone who’s thrilled and humbled to be on the same stage as this guy. I went to see Pink Floyd lots of times when I was younger, as a kid with my brother, and to think I’d end up playing some of those songs with him is a thrill. MM: So after this tour, does Saucerful of Secrets continue? Do you guys tour again? GK: Yeah, there are lots of plans. There are plans for possibly some recordings. There’s another European tour we’re doing throughout July. We’re playing open-air amphitheaters, and we’re headlining a couple of festivals across Europe. After this tour, we go back to Britain, and we’ve got some more British dates as well. There are plans going into 2020. And I’m loving it, absolutely loving it. It gives me a chance to stretch out on stage like I’ve never done before. It gives me a chance to front a band like I’ve never done before. And the camaraderie and the musicianship are extraordinary in this group. MM: It sounds like you’re having a great time! MM: Great. Now, I do want to ask you a bit about Spandau Ballet. MM: Spandau is on hold while you’re doing this. GK: Well, Spandau’s on hold yeah. There are no plans for Spandau. So after this, I’ve got some more acting work coming up in September. I’m doing that with my brother. I just did some theater in December, and Christmas I did a Harold Pinter production in the West End. I have a lot of stuff going on outside of Spandau Ballet. We’ve been through quite a lot of disruption over the last few years. And I don’t know really where that’s left us, to be honest. MM: Since you mentioned acting, your brother was saying something in an interview about perhaps a documentary — or mockumentary? Can you shed any light on that? GK: We might be doing some work for the BBC in the autumn, working with some very interesting, cool people from London. That’s all I can say right now. But that will be scheduled for the end of the year. Yeah, we might get our acting heads on. MM: Okay, that’s great news. Getting back to Spandau Ballet, you’re such a brilliant lyricist, you write some of the most beautiful songs ever. And it’s a joy to see you guys perform, to be honest. So the fact that you guys are on hold makes me rather sad. GK: As you know, we lost Tony [Hadley]. And we did a small tour of Europe with a new singer, you know all about that right? GK: Yeah. I don’t know. I still struggle to imagine Spandau Ballet without Tony Hadley. And whether that will ever happen again, I don’t know. And if it doesn’t, then maybe that’s it. I don’t know at the moment. I think that’s where my head is at right now. I’ve written a lot of stuff, and I’ve got a lot of material that’s backed up. But when I listen to the lyrics of those new songs, they just seem to be about me. They don’t seem to be the kind of material that a younger man could sing. They seem to be about where my head’s at now. So, I’m thinking about doing a solo record. I don’t know. I don’t really mind if it is important or it isn’t to other people, but it might be important to me. So, in the gaps between working on the things I’ve got now, I’m leaning toward a solo record as a possibility for next year. MM: I think that would be terrific. I want to ask you, everything that you’ve written, and all the songs that you’ve done, what are you most proud of? GK: I can’t say anything specific, but I’m proud of my acting honestly. I was just recently on stage doing Pinter with some serious actors. That makes me feel like stuffs going, that I get to experience working with top directors and top actors, doing the West End plays. That really turns me on, and it makes me proud. I’m proud that what I made in the ’80s is still alive, that there are certain songs that still are in the ether, that mean things culturally to people. Even if they don’t know who Spandau Ballet is, they may well know a song or some of the music. And that makes me feel proud that we helped to effect something culturally in the West. So rather than a specific song, I think it’s all of that. I’m very proud of the fact that I’ve had the busiest 12 months that I’ve had for years, which means that at my age, because I’m going to be 60 in October, things are working out. MM: You were talking a little bit about culture and cultural touchstones there, and that just makes me think how Spandau Ballet were very in tuned with fashion. Are you taking different fashion cues for the current band than you might have with Spandau? GK: Do you know what? Spandau were really good at creating fashion, rather than being in tune with fashion. I think we were living in a time when kids were really changing things tribally on the street, and then going through the clubs, and then onto the stages within those clubs. And then that would be taken and put in the high street. I think Pink Floyd in the early days, back in 1967, when they were playing clubs in London like the UFO Club, they were doing exactly the same. They were that kind of a band. They were creating looks that were coming out of the clubs. And then they were creating swinging London because of that. So, there’s an affinity there for our early parts of our careers, even though both bands now are much more subdued. 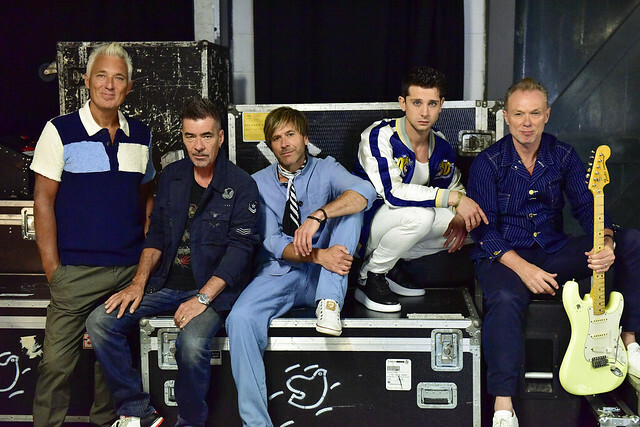 MM: I caught Spandau Ballet on the 2009 tour during the reunion when you played in Glasgow. MM: What an incredible show, and then of course I saw you were you were at the 9:30 Club here in DC in 2015. MM: But here’s the thing. You guys are amazing players individually I think, and obviously Tony Hadley adds something to that. And I did want to say that there was this totally electric moment in 2009 where you and Tony did a song together, sitting side by side on stage. And you could feel the power of that moment. And part of the reason I bring it up is not only because of Tony. In our society, there aren’t a lot of cases where you have these amazing portraits of men interacting as friends and as brothers — literally in your and Martin’s case — and I always thought that Spandau Ballet were such an amazing thing because you all have your individual strengths, and you all play very well in your own thing. But then you come together in this bigger whole, and it is a remarkable thing to see. GK: I think why that moment you mentioned — that acoustic moment — was so strong was because of the history of what Tony and I had been through together legally. And we could get over our differences, and sit on stage, and realize what was important, what we created, and be proud of that. Then, we still get a little bit of that to the audience. The sort of detente that we created was something that might be inspiring to people. Unfortunately, we constantly have maybe this kind of artistic disagreement that is never verbalized. After the last tour, Tony was insistent that he didn’t want to do it anymore for five years. I think that frustrated a lot of people in the band, who could feel time moving on and wanted to still make music together. I would still personally love to play on stage with Spandau Ballet, including Tony Hadley. But I don’t know, and I don’t think Tony will ever want to do that, so it’s probably never going to happen. But I still think that’s the ultimate goal and it always will be. MM: Is there a possibility that Tony or not, we will see something from Spandau Ballet again? GK: Well, I would never give it up. I see a lot of these double headers going out at the moment in America. And I just think that one double header that is still begging to be seen is Spandau Ballet and Duran Duran. MM: That’d be the hottest ticket in the universe! GK: Yeah, exactly. So who knows? Buy your tickets online for Nick Mason’s Saucerful of Secrets at DAR Constitution Hall.